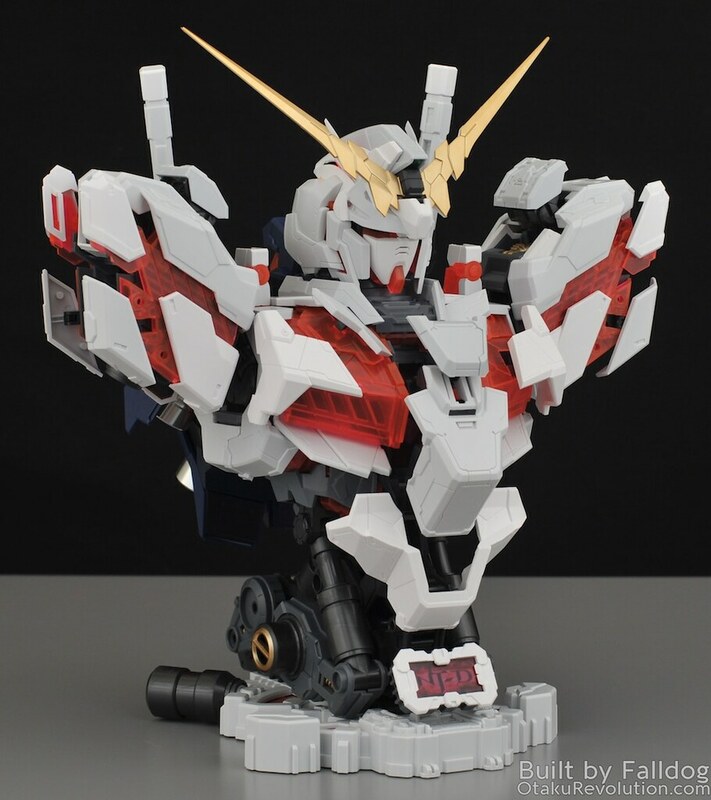 For the most part the BSC Unicorn is essentially a sized up version of the Perfect Grade Unicorn with extra detail and some modifications. 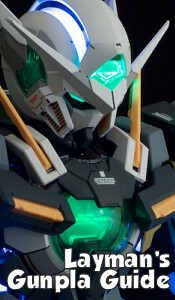 These modifications include external detail, additions to support an extensive LED network, more ways for the kit to flap open, and changes so that the kit is built from the ground up compared to the PG. A lot of the pieces are ripped right from the PG, you can even see vestigial connection points no longer used. Of course the mechanical looking stand is original (not sure if it's pulled from any other busts) and has a lot of potential to look stunning with some added paint. All in all, it's a really easy build. I had very little issues with the construction or the pieces themselves. Some simple modification was needed here and there just to get some of the larger pieces in easier and a few pieces will need glue (like the vulcans, not pictured because I don't want to lose them). There are a bunch of metal pieces, including metal tubing for the base (which I forgot I had until the end) and metal thrusters. There's some flashing, but way less than I expect from a third party kit. The white armor isn't uniform, some of the pieces are darker to break it up a bit, which is a nice detail. Some pieces are undergated, some are not, for the most part to no benefit or detriment on this kit. 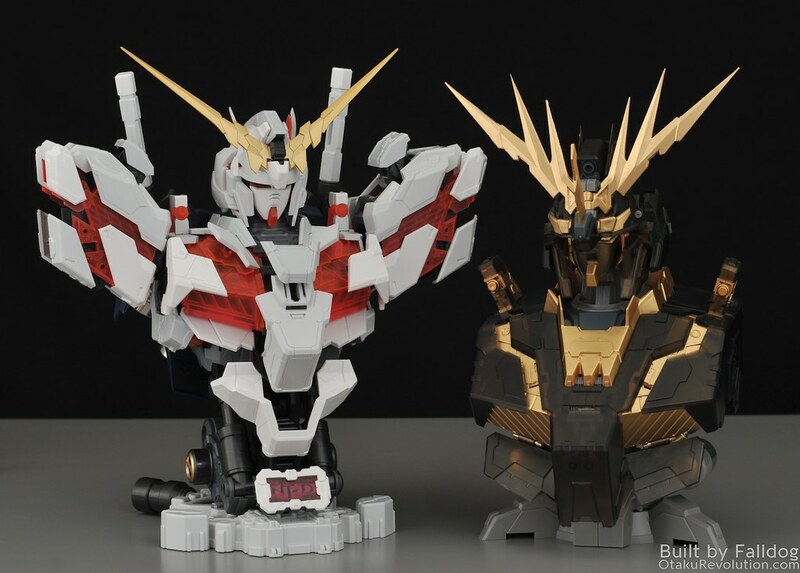 The gold coated pieces benefit the the most, but unfortunately the nub marks on the rear of the v-fin are still visible. 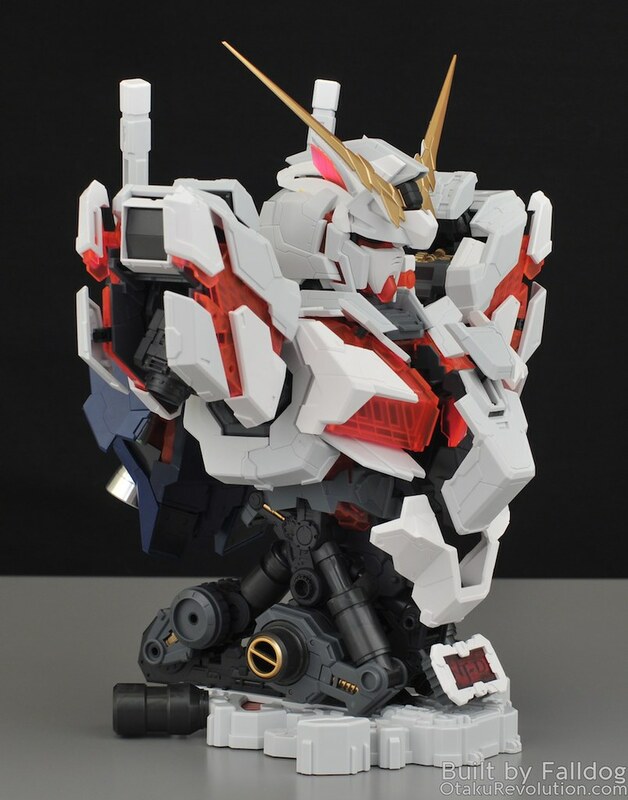 Eventually I hope to paint this kit because there are a lot of details to bring out. The decals what come with the kit look good, but seem way over the top on an unpainted kit, hopefully they'll look better once I'm done. 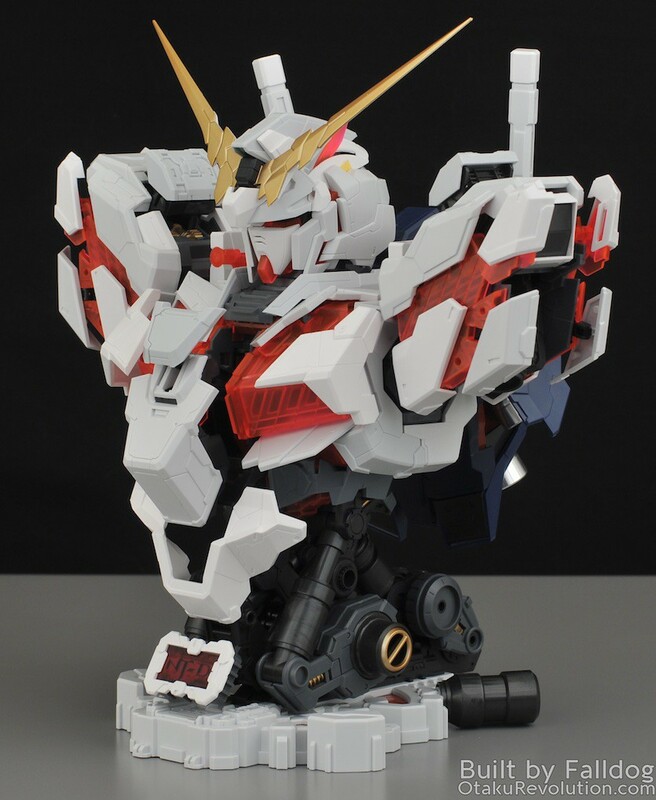 I recommend this kit to fans of Gundam busts, or general Unicorn fans like myself. As noted before, there are lot of new pieces that open up. The edges on the shoulders fold outward, as well as a new piece on top. Most of the changes are on the front torso. Not only does the cockpit open up, but the pieces on either side flap out, the piece on top of the cockpit flaps upward, and the piece below moves out as well. No extra flappy bits on the head or backpack. 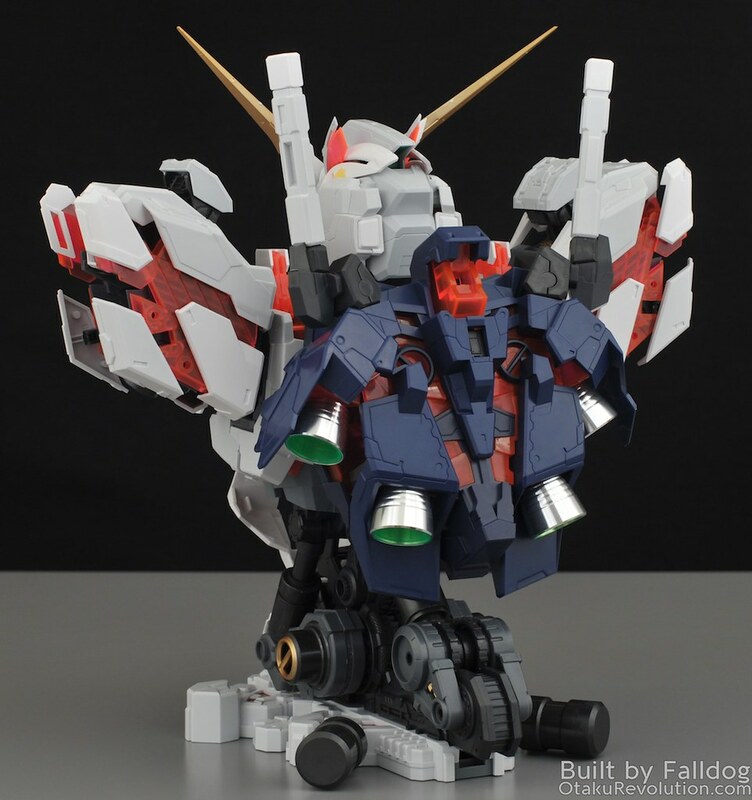 It's worth noting that this kit does not transform into Unicorn mode. 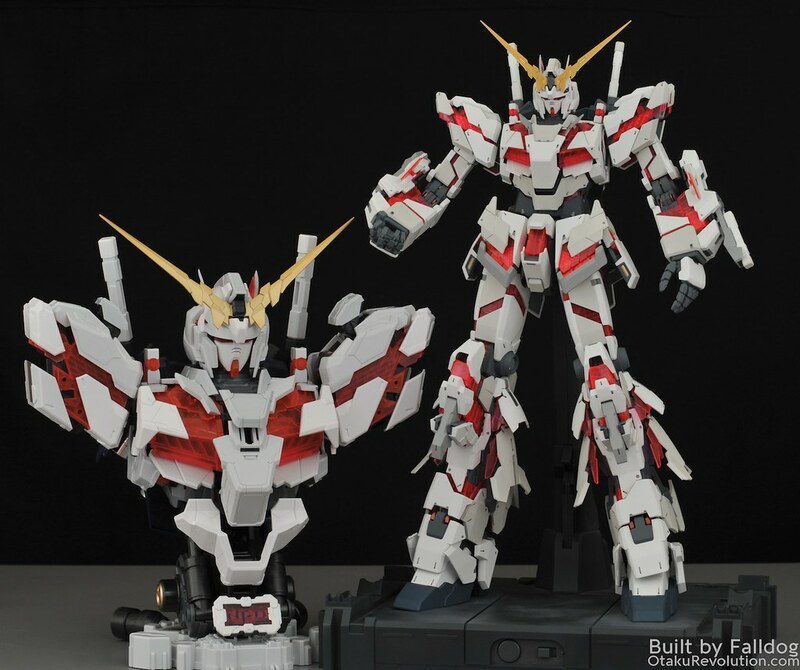 Size comparison with the PG Unicorn. Size comparison with Seraph Hobby's 1/35 Banshee bust. Obviously someone's gotten their scale ratio wrong.